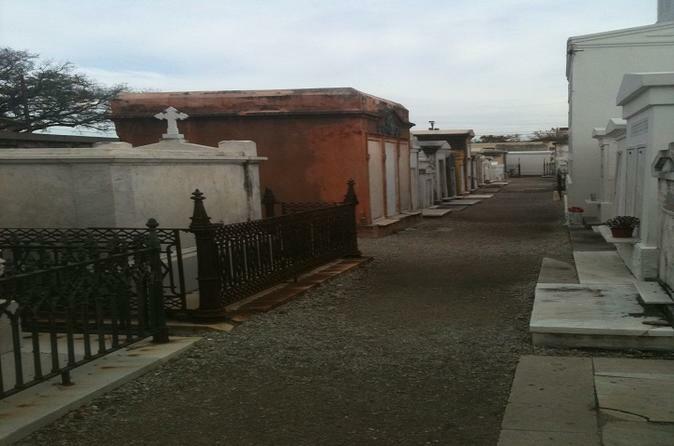 Visit one of the most famous cemeteries in New Orleans on this 2-hour tour of St. Louis No. 1. Learn about the city's unique cemeteries and burial customs - including above-ground tombs. See the graves of well-known New Orleanians, including Voodoo Queen Marie Laveau. Meet your guide in the heart of the French Quarter and walk to the nearby St. Louis No. 1, the city's oldest cemetery. St. Louis No. 1 opened in 1789 in a relatively small space. Thousands of entombments have taken place here in the intervening centuries, accomplished through unique local customs of burial and re-use of tombs for multiple burials. This cemetery is well over 200 years old and serves as the final resting place of some of New Orleans' most famous historic residents, including Voodoo Queen Marie Laveau, the chess master Paul Morphy, and Homer Plessy of the Plessy v. Ferguson court case. Your guide pulls from an immense amount of information on hand to give your experience in the cemetery depth and color. You won’t just get to see the graves of some famous people – you will also get to learn about their lives, the burial ground, and so much more. What secrets lurk behind the great Voodoo Queen’s tomb that you have yet to learn? What mysteries lie within and around the crumbling walls of this historic cemetery? All these questions and more are answered on this exciting and fact-filled tour. If you’re a movie buff, there's a treat for you, too. All of the information shared on the tour is historically accurate, factually based, thoroughly researched, and vetted. You'll leave St. Louis Cemetery No. 1 feeling more knowledgeable and excited about the information you’ve learned.